South Korean government has set a target to ramp up local annual production of hydrogen fuel cell electric vehicles to 100,000 units in six years from current fewer than 2,000 units as part of its efforts to lead a so-called hydrogen economy in the country. The government in a meeting attended by President Moon Jae-in and Trade, Industry and Energy Minister Sung Yun-mo in Ulsan on Thursday unveiled its roadmap for fostering a hydrogen economy, one of the country’s three key new growth engines for the economy along with artificial intelligence and big data. According to the roadmap, the government will increase the country’s production of hydrogen-powered electric vehicles to 100,000 units by 2025 with a cumulative volume of 6.2 million by 2040. Currently, fewer than 2,000 hydrogen fuel cell electric vehicles have been produced so far in the country. It expects hydrogen car’s price would also be halved to around 30 million won ($27,000) from the current level once the annual production hits 100,000. To bolster the growth of hydrogen-powered vehicles, the government plans to set up 1,200 hydrogen charging stations across the country by 2040. It will first increase the number to 310 stations by 2022 from current 14. It is also mulling offering subsidies for building charging stations in the initial stage. Setting up a hydrogen charging station reportedly costs around 3 billion won. The public transportation sector will also be turned more eco-friendly. The government will supply 35 hydrogen buses in the country’s seven major cities this year with an aim to increase the number to 2,000 by 2022 and 40,000 by 2040. It will also launch a pilot project for hydrogen taxi this year, starting with 10 units in Seoul, and expand out to other major cities from next year. The government expects the hydrogen economy would create an added value of 43 trillion won and 42,000 new jobs in 2040 if all plans go through as outlined. 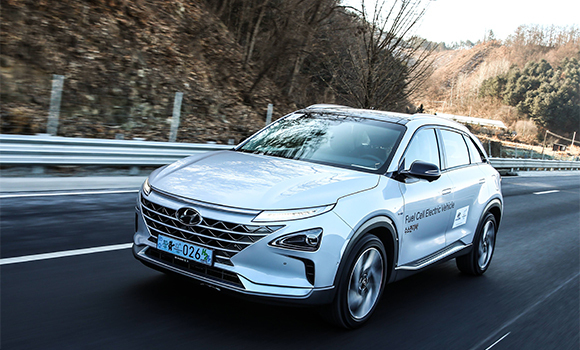 To work along with the government on the hydrogen initiative, Hyundai Motor Group that owns the leading hydrogen fuel cell technology in December unveiled its own hydrogen roadmap to mass produce 500,000 units of fuel-cell electric vehicles by 2030. Hydrogen used to power spaceships and rockets is being adopted more widely for ground vehicles as they can be sourced from renewables. Because of the complicated production process and high costs, there are, however, only a few carmakers ? Hyundai Motor, Toyota and Honda ? producing hydrogen-powered vehicles. Backed by Hyundai Motor with the world’s leading hydrogen fuel cell technology, the Korean government hopes to proliferate the hydrogen economy that is expected to help not only reduce fine dust and greenhouse gas emissions but also provide new growth momentum for the local automotive industry.